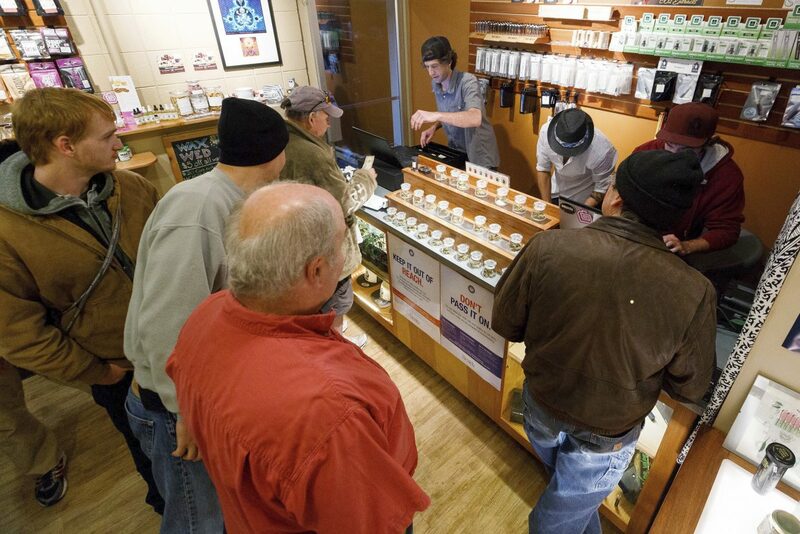 In this Oct. 1, 2015 file photo, employees of Amazon Organics, a pot dispensary in Eugene, Ore., help customers purchase recreational marijuana. Three years after Oregon lawmakers created the state's new legal marijuana program, marijuana prices in the state are in free fall and the craft cannabis farmers who put Oregon on the map decades before legalization are losing their businesses to emerging chains and out-of-state investors. Both of Nevada’s U.S. senators have signed on to legislation designed to provide legal marijuana businesses access to banks. Sen. Jacky Rosen, D-Nev., echoed that point. “Nevada’s marijuana businesses are continuing to operate as cash-only businesses as a result of federal laws blocking access to financial institutions and services, leaving many of these businesses susceptible to theft,” she said in voicing her support for the SAFE Banking, the legislation that would allow marijuana businesses the same access to financial institutions as other legal businesses.. The House Financial Services Committee voted 45-15 to advance the proposed bill in later March after amending it to include provisions to provide a safe harbor for insurance companies and improve access of financial services to minority- and women-owned cannabis businesses.The proposal was originally introduced by Reps. Ed Perlmutter of Colorado and Denny Heck of Washington state, both Democrats, and Ohio Republicans Steve Stivers and Warren Davidson.Banks generally balk at servicing the marijuana industry for fear it could expose them to legal trouble from the federal government, which still considers marijuana illegal.As a result, a large portion of the fledgling industry is left to operate on a cash-only basis, which creates security, money laundering and other criminal concerns.The Associated Press contributed to this report. Send an email to Tribune staff at editor@tahoedailytribune.com.